Focusing mainly on more classical and patristic texts. These are the texts in the O’Donovans’ work. So, if you wanted to read in the patristic tradition and how earlier Christians engaged in political reflection, this is a good list. First Apology. Sections 1, 2, 4, 10, 11. Irenaeus of Lyons: Empire as a demonic force; Christ’s coming into the world was already an act of judgment (O’Donovan 16). Against Heresies V.24-26. Also contains some of his eschatology. Clement of Alexandria: Contrary to Plato, philosophical kingship is already present because God manifested it in His Son (O’Donovan 31). Lactantius: The meaning of property is given by the structures of community relations in which material goods are communicated (O’Donovan 47). Divine Institutes III:21-22; V:5-7, 14-15; VI:10. Eusebius: The Word (Logos) of God mediates the kingship of God. Ambrose of Milan: emergence of episcopacy; renounced private property in favor of an “ecclesial sociology.” Institutionalized charity. Explores different forms of economic slavery (O’Donovan 69ff). Story of Naboth, 1, 2, 4, 11, 12, 36, 37, 52, 53, 63. John Chrysostom: aesthetic of Christian government: “the drama of overcoming wrath with mercy” (O’Donovan 91). In giving charity, the giver reasserts the original community of goods. Augustine: the law of Christ can be obeyed in time of war if the right attitude is sustained. Civil justice prepares the way for penitence. We must look behind the tasks of authority to the society that gives authority its rationale (O’Donovan 109). City of God II:20; IV:3-5; V:24-26; 14:28; 15:1, 2, 4, 5; 19:5, 7-15, 16, 20, 21, 24-27. (1) Unity of Old and New Testament: God’s Logos. (2) The crossbeams are the world’s true center–it is here where creation is renewed (13). The four points of the cross match the “four corners/dimensions” of the world (Irenaeus 16). 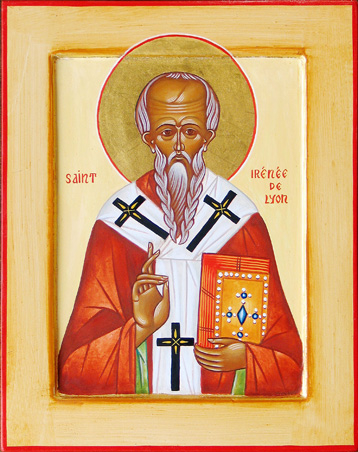 By God’s simplicity, Irenaeus means he is non-composite. God is “wholly mind, wholly thought, wholly reason, wholly hearing, wholly seeing” (Irenaeus 19, quoting AH II 13, 3). Since God is rational, he produces things by his Logos and orders them through his Spirit. The Spirit manifests the Word (Defense of Apostolic Preaching, 4-10). God’s thinking is His Word and the Word is Mind (AH II.28.5). “He is rightly called the all -comprehending intellect, but he is not like the intellect of man. He is most aptly called light, but he is nothing like the light we know” (AH II 13, 3). God confers proportion and harmony on what he has made (II.25.2). “The second Adam is the repetition, in divine truth, of the first Adam…The second Adam repeats the whole natural development of man at the higher level of divine reality” (von Balthasar 53). Indeed, “what was bound could not be untied without a reversal of the process of entanglement” (AH III.22.4). (Redeemed) Man is body, soul, and spirit (AH V.6.1). Without the spirit man may have the image of God but not his likeness. The Spirit saves and forms the flesh and the soul finds itself mid-point between the two. The breath of life (ruach) is not the same as the life-giving Spirit (1 Cor. 15:45). The former makes man a psychic being; the latter makes him spiritual (V.12.2). 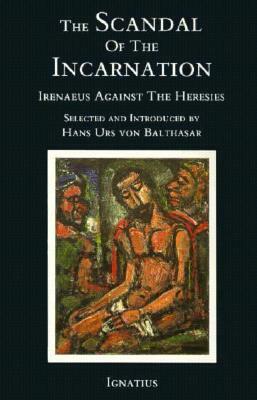 One of the most interesting–and underdeveloped–aspects of Patristic thought is St Irenaeus’s “Recapitulation” view. On its broadest level it is simply Ephesians 1:10–Christ sums up all things in heaven and earth in himself. But what does that really mean? How far can you take it? The structure of anakephalaiosis is this: events repeat one another;the story involves not just progress, but restoration. Certain signal events are contained within later events which recontextualize familiar motifs. The repetition of these motifs helps us understand liturgy and history. (1) Recapitulation causes positive events or structures to come about. How is this relevant to Vladimir of Russia? Upon conversion (and I will accept the Chronicle as more or less accurate) Vladimir put away his concubines. Contrast this with Solomon, who gained concubines. Before conversion Vladimir had drunken orgies. After conversion there was still alcohol, but he now invited beggars to feast with him. Some more meditations on recapitulation. If Christ sums up all things in himself, and time is a created entity, and hence a thing, then time itself is affected/effected. (2) The structure of time–at least in theory and according to Ephesians 1–is fundamentally altered. (2*) Time participates in eternity. (2**) The exalted Jesus is where past, present, and future coincide. (3) We meet the eschaton in Jesus.